Before I attempted The Arrangement I would have laughed at the suggestion that I could write a complete story in less than five thousand words. Brevity and I are not mates. I like my sentences long, my characters hard to grasp in the first, oh, let’s say ten or so chapters. Regardless of genre, the novels I best enjoy reading involve sequels. But then it’s also true that I enjoy a challenge. My initial idea for The Arrangement involved a lengthy character arc, multiple parts—none of which were in any way suited to the short story format. Without the luxury of pages and pages of context with which to buy a reader’s goodwill, a short story has only a few lines’ worth to grab the attention. Yet there’s no point in hooking the reader if the characters aren’t sketched out fast enough to reward that indulgence. I vacillate between writing lengthy backstories for my characters and plunging in with only a vague idea of what they’re about. For The Arrangement, I couldn’t afford the latter. It seems counter-intuitive, but the shorter the story, the more necessary I feel it is to have a clear picture of who does what to whom and why. There’s no time to figure it out in the text, much less to hint at events later on in the story. By the time ‘later’ arrives, we’re already wrapping up. Setting is equally constrained. A novel can span decades or the breadth of Middle Earth. A short story doesn’t have the luxury of sprawling. I imagine a short story as a theatre play, with one or two changes of décor at the most and with the understanding that whatever happens on stage, it’s conceivably contained within a few days at most. Everything is immediate and of the utmost importance, and reflection is in short supply—conveniently, this lends itself well to characters stumbling into misunderstandings that further the plot. Yet just as a full-length novel, a short story without a climax and resolution won’t be very satisfying. In The Arrangement, conflict comes to a head almost unilaterally, as Cyril refuses to go away quietly after a breakup with his much older partner. The crisis that sparks said conflict is the breakup itself, but without a character willing to claw his way back into a relationship, the mix-up that sparks the separation might never be resolved. Short stories are like puzzles. 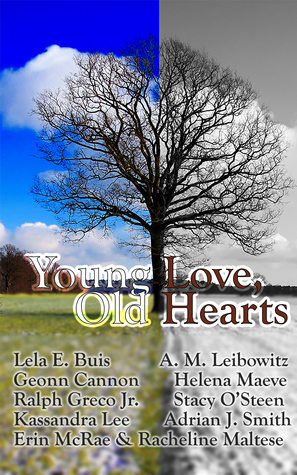 They’re a pain to untangle and they dissuade us from letting our thoughts roam, but as I’m sure my fellow Young Love, Old Hearts authors will agree, it’s so rewarding to figure them out. August was at his desk, dress shirt open at the collar, tie and suit jacket absent. Ruthlessly beautiful. His idea of casual somehow still left him looking powerful and business-like. He plucked his rimless reading glasses off with a smooth gesture, but tension lingered in his expression. After six months, Cyril could tell when something was wrong. “Have a seat,” August suggested with strained formality. Less than an hour ago, he’d been edging Cyril to the brink of climax and back again, relishing his cries like a true sadist. Their bedroom dynamic was too overwhelming to set aside at a moment’s notice. Cyril complied, annoyed with himself for the meek show of obedience. Cyril’s heart slid lower into his knees. The wide stretch of a sturdy wooden desk divided them. It was an effective visual barrier; Cyril could pretend he’d been summoned to a supervisor’s office rather than his lover’s. The similarities were striking. Don’t say it. Please don’t say it.